The steps below will walk you through connecting a payment service that is already set up in Dynamics Online to your EFT Service in the Retail Hardware Profile. These steps would need to be followed for each new hardware profile that is configured for each store that has a different payment service. If you have different hardware profiles for the same store and want to use the same payment service on each profile, you would still need to perform these steps. The Microsoft account would be the same, but the system user would still need to be created in Dynamics Online as the public key would be different for each hardware profile. With this in mind, you can also use these same steps to configure the same payment service in a Test environment and a production environment. NOTE: If this auto logs you in with an account that is saved in the browser that is not valid for Dynamics Online, go to www.live.com and sign out first. 9. Either select an existing profile to modify it, or click New to create a new hardware profile with a new name. 13. Enter in the Microsoft account and Microsoft account password. NOTE: This is also known as your Windows Live ID. The user entered here is what is used to access Dynamics Online and the payment service. They must be set up with access to that payment service in order for the login to authenticate. 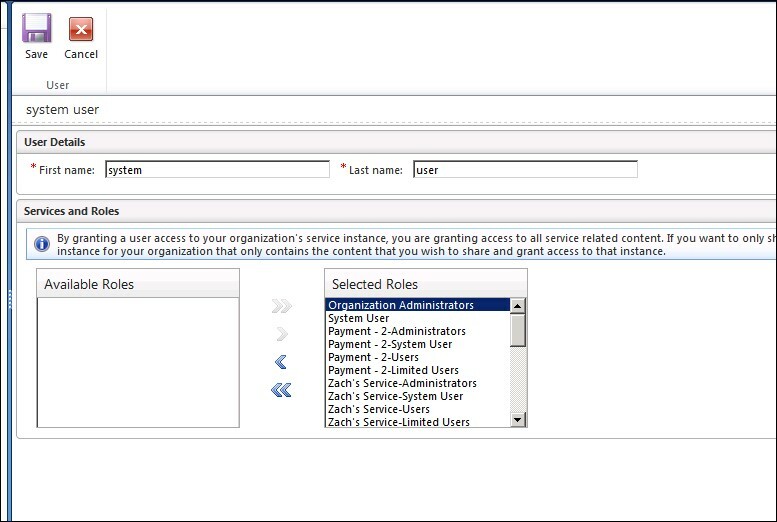 Setting up a “User” account can be done in the Dynamics Online partner or customer portal. NOTE: If you receive an error that the entered account is not valid, ignore this error as AX performs an invalid check against the ID. 14. The Environment field is already populated as PROD and this should be left as is. 15. Highlight and copy the entire Public key. As a test, paste the contents into a text document to ensure it copied the contents properly. This is a fairly large key and at times this has a tendency to copy the fields in the form instead of the key. If this happens, simply close the payment services window and reopen it to try the copy again. 16. Switch back to the Dynamics Online customer portal. 17. Click User management in the navigation pane. NOTE: This is different than the user in Step 13. 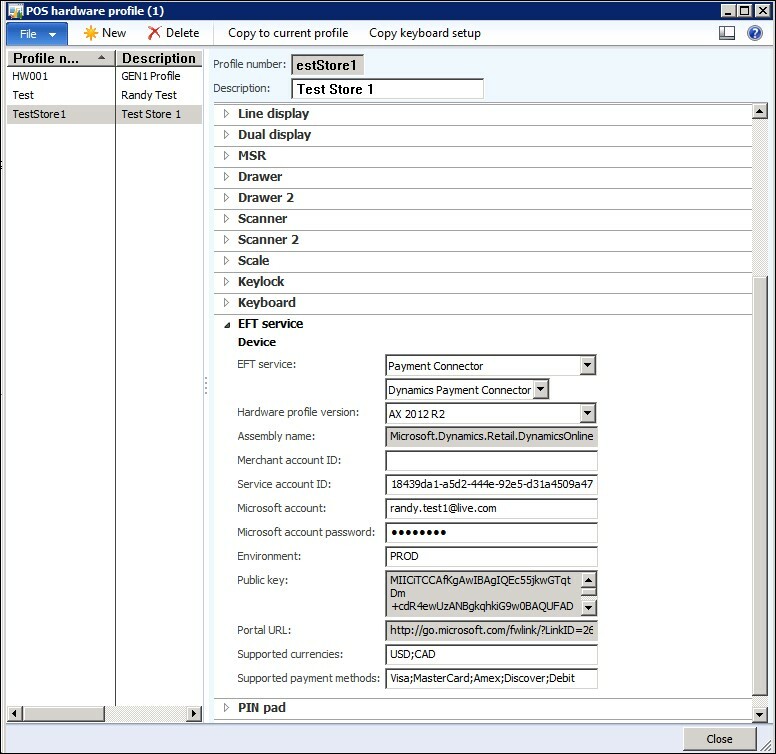 This system user account hosts the Public Key that helps connect the ERP to Dynamics Online. 19. (Optional) Change First and Last name. I recommend doing this to know which entity this system user is for if you have more than one payment service set up. 22. Select the System User we just created by placing a checkmark next to it. 24. Add the specific system user role for that payment service or all roles to the Selected Roles by clicking on the >> sign. 28. Select the A-1090 or N-1090 job to update the POS with the hardware profile update. 30. Start POS or restart POS (just the POS application) if POS was already open. 31. Process a test transaction with your credit card tender process. 1. Normally any authentication issues deal with the user or system user account not having access to the payment service. 3. Error 50000 – This refers to a credit card misconfiguration in AX with the payment method, card type, or card number. 4. Validation errors stating that the entered Microsoft (WLID) account is not valid can be ignored as AX performs invalid checks against the ID.